MILAN, Jul 10 2013 (IPS) - It didn’t take the financial crisis for hundreds of thousands of workers across Europe to protest the new plague of the labour market – precarity. But the financial crisis has only made it worse. The idea of “precarity” was coined by the No Global movement in Italy back in 2001 to define the condition of a new generation of workers who have no option but to take up short-term and unstable jobs. Now, with unemployment skyrocketing across Europe, the quest for better working conditions and a common European strategy to tackle precarious work seems further than ever. 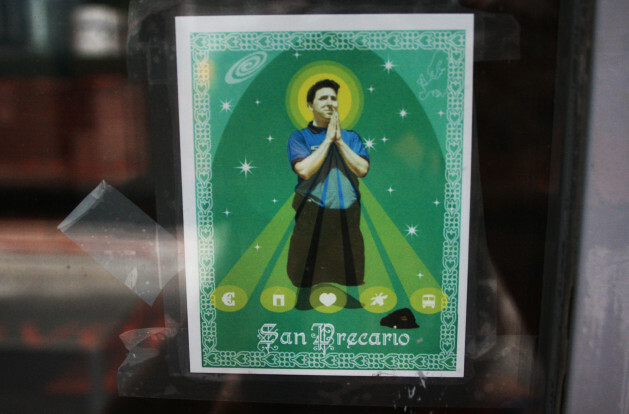 San Precario (Saint Precarious), who was declared patron of all precarious workers, is an iconic image created to recall Catholic saints believed to protect the faithful. The “saint” made his first appearance in October 2004 during protests against multinational chains “but the group that created him was active since 2001, when we organised the first May Day parade,” said Marca. Transnational mobilisation such as the anti-G8 demonstrations and the European Social Forums allowed many grassroots movements to connect and raise cross-border initiatives. The world of precarious workers was one of the concerns taken up. In 2004, May Day in Milan became the Euro May Day Parade. According to Sandro Gobetti, president of the Italian Basic Income Network (BIN), the gap among European Union welfare systems could be one reason behind the failure of an international movement of precarious workers. The introduction of a minimum income is indeed one of the core battles for San Precario. “The grassroots movement of precarious workers has been the undisputed protagonist of the fight for the introduction in Italy of a minimum income,” Gobetti said. BIN has been campaigning along with another 170 associations to collect signatures for proposed legislation on minimum income in Italy. The pioneers of the first European precarious network decided to go back to the national level, but others are still looking at the broader picture. Stanislas Jourdan, French activist from the Unconditional Basic Income (UBI) network, is pursuing a European project. “The European Citizens Initiative (ECI) is a tool that enables citizens to speak out,” Jourdan told IPS. As the European Commission site explains, the ECI allows citizens, upon the collection of one million signatures from at least seven out of the 28 member states, to participate directly in the development of EU policies by calling on the European Commission to make a legislative proposal. The UBI aim is to pressure Brussels to adopt a unified basic income system for all EU citizens, regardless of their working and financial situation. “Everyone would get a basic income, which is universal, unconditional, attached to the individual rather than the household, and high enough to ensure basic needs and for participation in society,” Jourdan told IPS. Skeptics inevitably pose the problem of financial backing for such measures. Jourdan said the proposed basic income would be fairly low and would serve only as base that each member state should top up with their own resources.